Save the Dates! 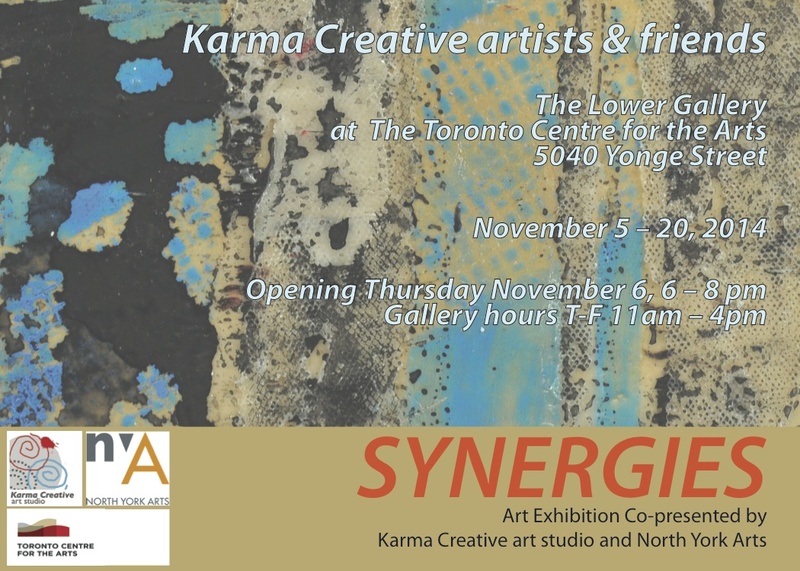 Two Amazing Karma Art Events in November! We are excited to announce our new partnership with North York Arts. Karma Creative Art Studio is co-presenting two inaugural events on November 6 and 15 and hope you can attend! 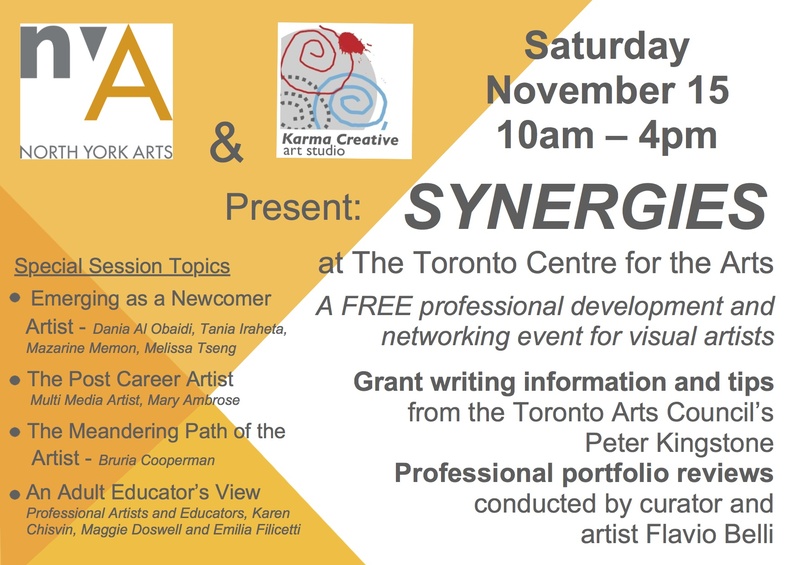 The Synergies Art Exhibition is from November 5 – 20, 2014. The media of the exhibiting artists, established and emerging, includes acrylic, encaustic, photography, sculpture and mixed media. The focus of the show is on the “synergy” that comes from artists working together. The Synergies FREE Professional Development and Networking Event is on Saturday, November 15, from 10 am – 4 pm. Come out and hear presenters on a variety of topics that will advance your practice. It will be a day dedicated to professional development and creating connections that increase an artists impact. This event is for all artists, novice to professional! 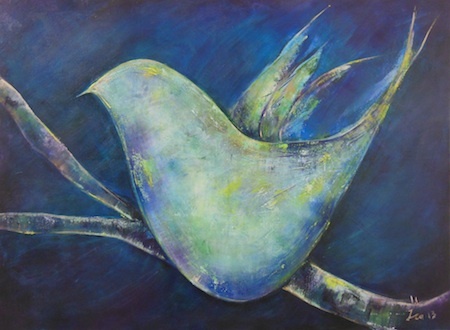 Paint with Irina 3 Monday evenings in April and May! Let Irina’s passion and enthusiasm for painting help you in your creative journey. Irina will guide you through your learning experience to bring out hidden talents, reawaken long-forgotten skills, or simply paint for its own sake. Mondays April 22, 29, May 6 6:30 -9:30 pm. Suitable for all – novice to expert. Register soon – spaces are limited. We’re excited to show you the diversity of work from Karma Creative member artists. Our work is now on view at The Mad Bean Coffee House for the month of October. Stop by and see for yourself! Come and experience the Karma Creative magic! With your enthusiasm and sense of play, and our studio materials and support you’ll be painting away like Annika C. A one-hour sampling class will allow you to meet and work with a Karma Creative studio artist-instructor and engage you in your passion. Novice or expert, we can help you re-charge your creative energies. We’d love to meet you at Wychwood Barns Studio 152 on Thursday afternoons, or at 3962 Chesswood Drive on Saturday mornings. Other times by request. Call or email today and book your class. The good news is that the intro class is FREE! Get out of the sun and into the studio! At Karma Creative our Summer Students are really showing off. This summer many students have enjoyed Karma-Creative’s flexible art lessons. And after a few sessions they really amaze and delight. Here is the work of Soah Lu who worked magic with an acrylic lesson. 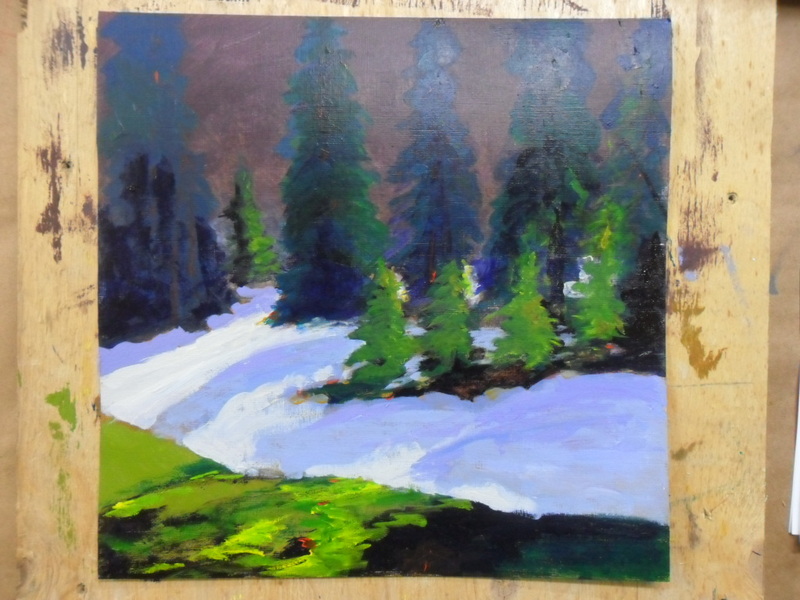 Her painting (after a Stephen Quiller work), was completed after only a few hours of acrylic painting fun in the Loft studio at Karma’s 3962 Chesswood Drive studio location. 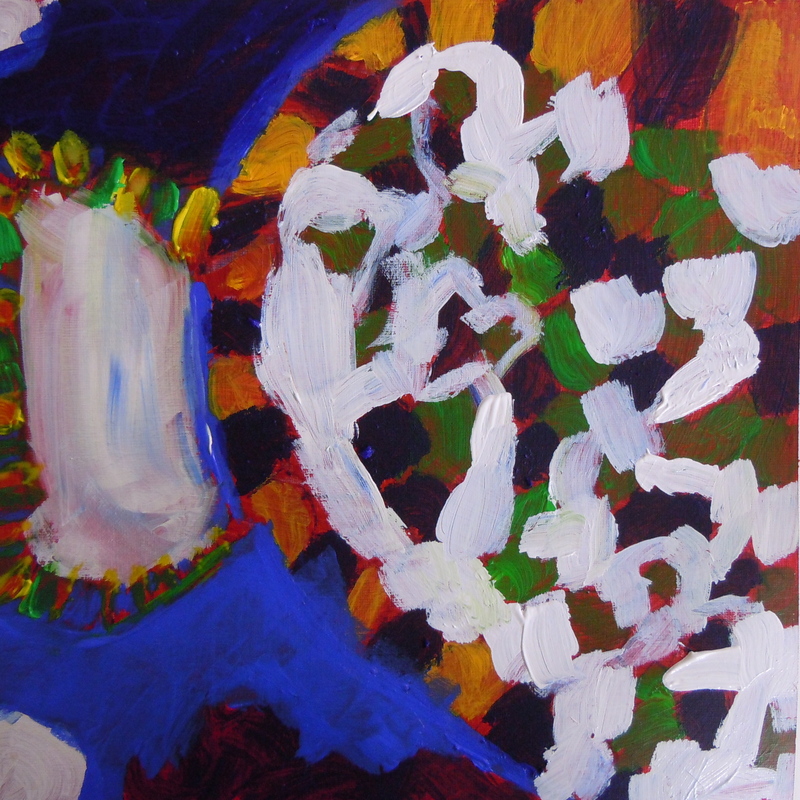 Soah’s choice of vibrant color and attention to underpainting really makes this painting work. It’s not too late to for you to enjoy a summer afternoon painting in the loft at Karma Creative. Call or email now and let us know you’re ready to go! 3962 is our new favourite number at Karma Creative art studio. On February 1, 2012 we are opening our new studio in north Toronto at 3962 Chesswood Drive. Join us there for all your favourite programs – encaustic, resin, acrylic and oil painting, mixed media, and fibre arts. This year we’re making a special focus on helping you to develop yourself as an artist with customized packages to meet your needs. You can also still call us at 416 707 7574, email us at art@karma-creative.ca, or call to see us at Wychwood Barns.